Article 16. When discussing and making decisions on any matter, Party organizations must keep to the principle of subordination of the minority to the majority. A vote must be taken when major issues are decided on. Serious consideration should be given to the differing views of a minority. In case of controversy over major issues in which supporters of the two opposing views are nearly equal in number, except in emergencies where action must betaken in accordance with the majority view, the decision should be put off to allow for further investigation, study and exchange of opinions followed by another vote. Under special circumstances, the controversy may be reported to the next higher Party organization for a ruling. Article 27. 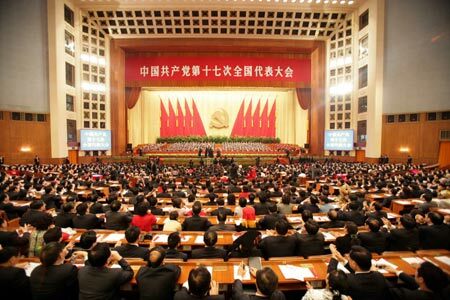 The local Party committees at all levels elect, at their plenary sessions, their standing committees, secretaries and deputy secretaries and report the results to the higher Party committees for approval. The standing committees of the local Party committees at all levels exercise the functions and powers of local Party committees when the latter are not in session. They continue to handle the day-to-day work when the next Party congresses at their levels are in session, until the new standing committees are elected. In offices of the Party or the state at all levels, the primary Party organizations assist the chief administrators in fulfilling their tasks and improving their work. They exercise oversight overall Party members, including the chief administrators who are Party members, but do not direct the work of their units.